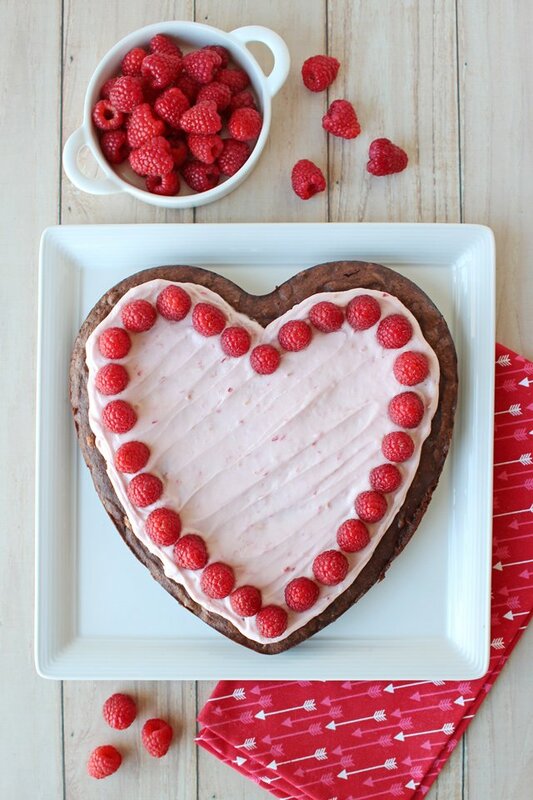 This cute Raspberry Fudge Brownie Heart is simply the perfect Valentine’s Day dessert! 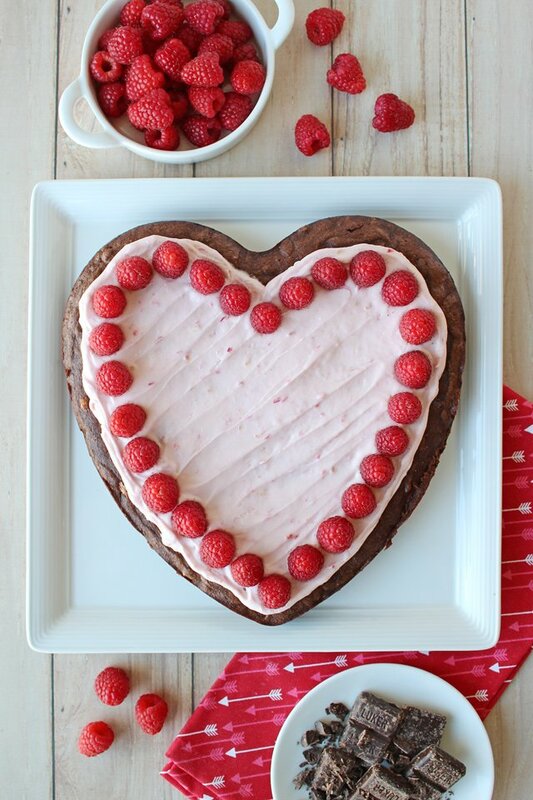 This recipe starts with my favorite fudge brownie recipe, baked in a heart to make it extra “sweet”, and then is topped with pretty raspberry frosting and fresh raspberries. This recipe is surprisingly easy to make (even from scratch), and it can be made a day in advance if needed. This recipe was created in partnership with Sprouts Farmers Market. I mean, how cute is this? 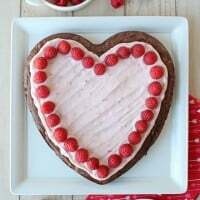 Of course you can make this recipe in a 9″x9″ pan if you prefer (or if that’s what you have on hand), but I do think it’s extra cute in a heart! I picked up this pan at Hobby Lobby recently, but you can easily find a heart baking pan on Amazon too! While you’re shopping, be sure to grab some parchment paper (to line the pan) and my favorite off-set spatula (to easily and neatly spread the icing). Of course if you’re not a fan of raspberries, feel free to prepare the brownie alone, or follow the frosting recipe and simply omit the raspberries. Add a drop of pink food coloring to the frosting (if desired) and then top with some cute Valentine’s sprinkles. I love shopping at Sprouts Farmers Market because I know I can find everything I need for my baking projects at an affordable price. Sprouts branded products are consistently high in quality, with an emphasis on natural ingredients I can trust. I especially love Sprouts bulk bin section because I can get so many of my baking staples (as well as snacks my kids love) in the exact quantity I want! I get to decide how much to fill my bag with. 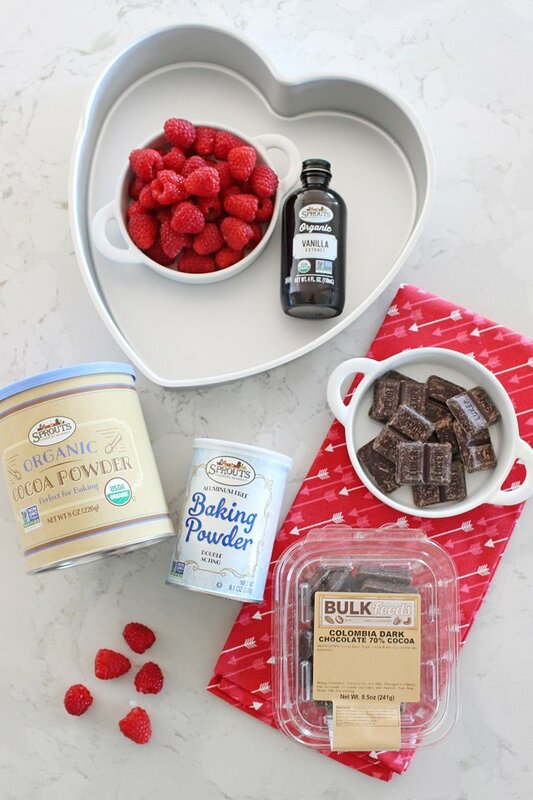 This Raspberry Fudge Brownie Heart recipe was created around Sprouts 70% dark chocolate, sold in the bulk bin area. Depending on your store, you may find this delicious dark chocolate prepacked in plastic tubs (as pictured), or loose in the bulk bins. Simply the perfect recipe for Valentine's Day! 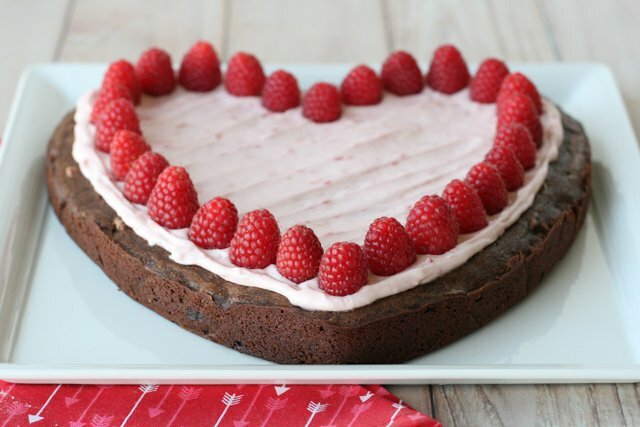 A perfect, homemade fudge brownie topped with raspberry frosting and fresh raspberries. Preheat oven to 350°F and prepare brownie pan by lightly greasing the sides of the pan with butter, then dust with flour or cocoa powder. Line the bottom of the pan with parchment paper. Prepare brownie batter by heating the butter and sugar together in the microwave until the butter is melted and the sugar is beginning to dissolve. Stir and set aside to cool slightly. In a large bowl, whisk eggs. Add cocoa powder, baking powder, salt and vanilla. Stir to fully combine. Add cooled (or just slightly warm) butter/sugar mixture to the egg/cocoa mixture and stir until smooth. Add the flour and chocolate chips to the batter and stir until fully incorporated. Spread the batter into the prepared pan and smooth as needed. Batter will fit in a 9”x9” square pan, or a 10” heart shaped pan. Bake brownies for 20-25 minutes depending on the size of the pan (test for doneness with a toothpick, do not over-bake). Cool at least 20 minutes before removing from pan, and then continue to cool fully before frosting. Prepare frosting by beating the cream cheese in the bowl of an electric mixer until smooth. Add butter and continue to blend until smooth. While mixing, slowly add powdered sugar. Add salt and vanilla, then add raspberries one at a time until the desired color and consistency is met. Spread frosting onto fully cooled brownies, then top with additional raspberries, as desired. If desired, the brownie portion can be made a day in advance and wrapped or covered well until the next day. I'd recommend adding the frosting and garnish the same day it's going to be enjoyed. Disclosure – I created this recipe in partnership with Sprouts Farmers Market. Partnering with brands I love allows me to provide you with high quality content at no cost to you. I only work with brands I use and love. All images, text and opinions are my own.